A pilsner that accompanied my pizza at I Due Forni. Even before I stepped off the S-Bahn into central Berlin and was struck by the pervasive graffiti and street art, I saw a shocking sight. Two men chatting on the train, drinking beer. And more people drinking beer walking up and down the streets, or waiting for food at a truck. Jonas (a friend of a friend) told me that beer is regarded as a basic food in the German diet, and while there are special taxes on alcohol as in many other countries, the legal and cultural attitude towards beer is as relaxed as towards bread. 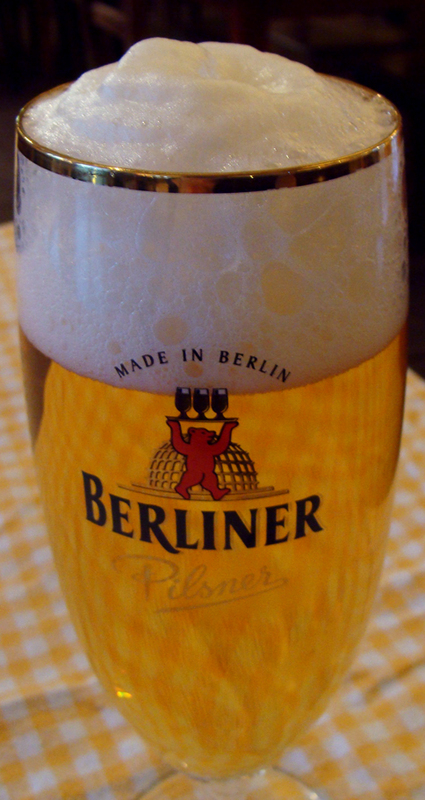 And many of my outings in Berlin were accompanied by beer. In Germany it is nearly impossible to escape lagers, which made me a bit uncertain about how happy I would be with my beverages, but I found them to be skillfully brewed and more interesting than I expected. I did eventually also manage to try some of Germany’s distinctive ale styles. But among the pils, helles, schwarzbier, weizen, and kolsch, one style stands apart as totally unique, sharing little in common with most well-known German styles (although somewhat similar to the obscure gose style), and the style calls Berlin its home. The Berliner weiße, a style I brewed before I’d even tried it, was the one beer I was determined to drink during my stay. Berliner weiße was once brewed by over 700 breweries in Berlin, but that number had drastically dwindled as breweries were consolidated, closed, or destroyed as a result of wars. By the time I was researching what I could expect to find, I could turn up exactly one Berliner weiße in existence: Berliner Kindl Weisse. The style is now brewed more in the US than in Germany or even Berlin, though as with champagne the appellation is protected by law and should only be used for beer brewed in Berlin. Still determined to drink this beer, I visited beer historian Ron Pattinson’s beer guide website to learn about bars where I might find it. To my surprise I found that, despite noting that the Schultheiss Berliner weiße was discontinued when the brewery came under the same ownership as Berliner Kindl, he listed Zur Letzten Instanz as serving it on draught. While I was surprised and confused at the contradictory information, I didn’t dismiss the possibility outright since sour beers are known for their longevity. 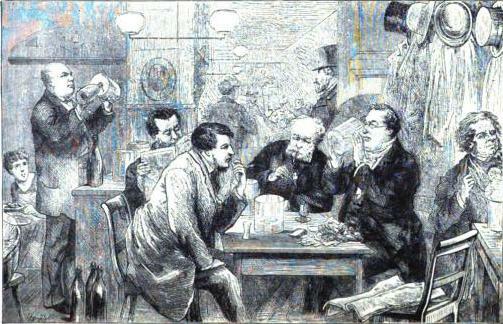 In its heyday when anti-spoilage techniques were less sophisticated, even the low alcohol, lightly hopped weiße was often stored for up to a year before serving. This excited me – not only might I get to try the Schultheiss after all, I might find it on draught! I had only ever heard of the style being served from bottles due to the extremely high level of carbonation (which makes it difficult to dispense from a keg). 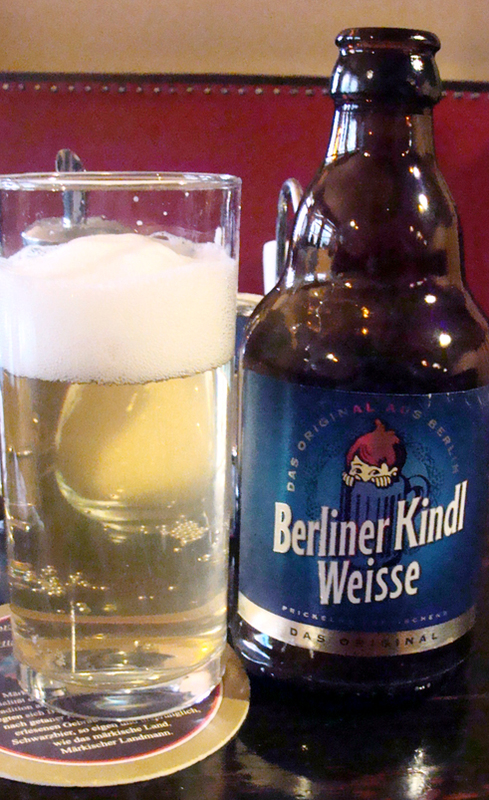 My first stop was for Berliner Kindl Weisse at Sophieneck in the Mitte district. I was also hungry for lunch, so I ordered schnitzel, not really knowing what it was but curious to find out since I was in Germany. The food didn’t thrill me, partly because it didn’t seemed skillfully prepared, but mostly because the attention of my senses were on the beer. 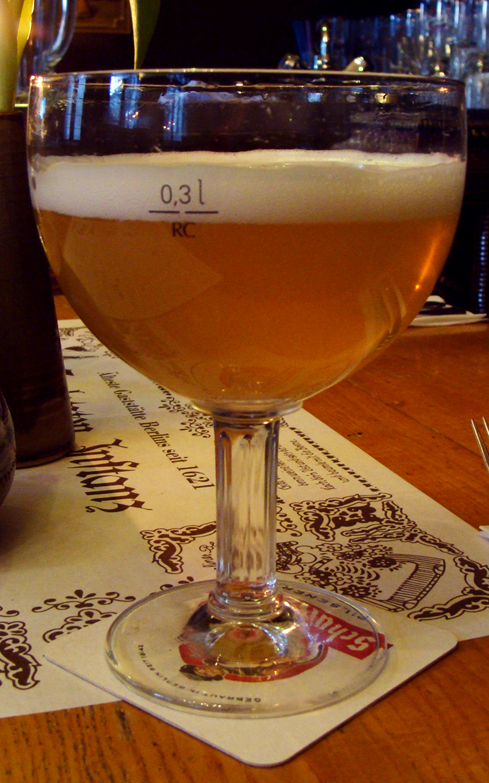 The beer poured with a thick, surprisingly long-lived foamy cap. Hazy and incredibly pale, the beer certainly deserves its moniker (weiße means white). The aroma was unmistakably lactic, which I realize may be a poor descriptor but is a distinct smell that has been imprinted in my olfactory memory since the first time I had a whiff (which was actually from a bottle of kölsch that had been infected). The carbonation was somewhat lower than I expected, especially given the lively foaming of the beer. Also, it was on the more restrained side of sour for my taste, and didn’t seem totally dry. However, the slightly sweet grainy flavor of the beer was pleasant, if not the character I was hoping for. Overall I was pleased with the beer, and happy that as with other examples I’ve had in the US (both brewed in the States and imported from cities in Germany) my homebrewed version measured up well. 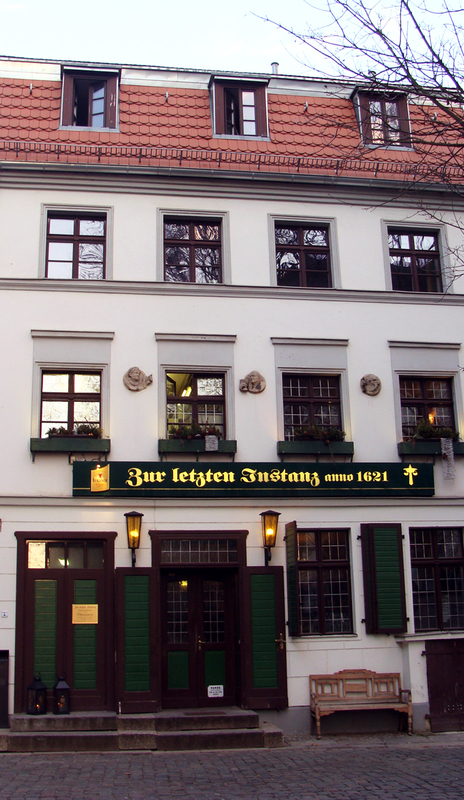 After that I was off to find Zur Letzten Instanz, which claims to be Berlin’s oldest pub, in hopes of spotting a brew thought to be extinct. I missed the streets I was looking for multiple times, and spent about an hour on a 20-minute walk. Finally I found the place on an inconspicuous road with no other businesses around as far as I could tell. I walked inside and was dismayed to find that the place was not what I would call a pub at all, but rather appeared to be a respectable restaurant. Almost every table was marked reserved, and there was no space for seating or even standing at the bar. I felt uncertain, but the restaurant was empty, so I asked if there was somewhere I could sit. One of the waiters showed me to a seat and said it was available for the next hour and a half, and then handed me a large menu. When he returned I ordered the weiße. He asked me which color I would like. It seems that at some point in the last century, a tradition developed of serving Berliner weiße with one of two flavored syrups, woodruff (green) or raspberry (red). It’s possible that this has its roots in an older tradition of drinking weiße alongside kümmel, but whether the tradition is 100 or 200 years old did not sway me – I was not interested in syrup. The waiter gave me a look of doubt and asked, “Are you sure?” I told him I was sure, and that I was just having the drink, no food. I felt disappointing. When the waiter returned, I felt disappointed. I had been duped! Even though the menu stating Schultheiss Berliner weiße, it apparently neglected to discriminate between Schultheiss and Berliner Kindl since they had come under the same ownership. My waiter poured the bottle into the large goblet that is typical for the beer and dropped a straw into it as if it were some kind of cocktail. I removed the straw and drank my beer. I have only discovered during my research for this post that I overlooked a brand new brewery dedicated to reviving the Berliner weiße style in its proper home. Bogk-Bier Privatbrauerei is practicing a return to traditional methods of mixed fermentation (Berliner Kindl ferments half of the beer on lactobacillus and half on yeast) including using brettanomyces, a behind-the-scenes character in many examples of weiße in decades past. I wish I had known about their beer before I left Berlin, but it has renewed my already strong interest in brewing this style again, and while Ron Pattinson may have led me astray in Berlin itself, his research is invaluable in learning of traditional techniques in the production of this beer. I’m eager to experiment with what I’ve learned from reading his blog. This entry was posted in beer, travel and tagged Berlin, Germany, lactobacillus, narrative, review, sour beer, weisse on February 19, 2014 by Dylan Bargteil.